To all of my travel-lovers who have their eyes set on Cuba, here’s some of what’s you need to know about getting there and what to expect. You ready? Before you leave the U.S. set a budget for how much money you want to spend while you’re in Cuba and withdraw it in cash. Then head to the bank and convert it to Euros. Once you’re in Cuba they charge you a fee to exchange U.S. dollars to Cuban pesos. I found out this tip when reading another blog and it saved me a bunch of money. My bank charged me a $7 fee to convert all of my money, which is less than I would have paid in Cuba. There are no ATMs in Cuba so plan ahead. It’s better to bring more money and have some left over than to be there without enough. Most airlines allow you to buy your visa at the airport before boarding the plane. I flew with JetBlue and they charged me $50 for the visa. The price may be different depending on the airline so check with your airline to be sure. When filling out the visa you have 12 options to choose from. I chose “Support for the Cuban people” when filling out my visa, but be sure to pick whatever categories best matches your actual reason for visiting. I’ve read that if you make a mistake while filling out your visa (like spell your name wrong or something) they will charge you to fill out a second one. I don’t know if that’s true, but be extra careful and take your time filling it out, just in case. Taxis can be your best friend. Bargaining is your second best friend. As someone who’s based in NYC when I do use a taxi (which is super rare!) you climb in the car and the driver turn on the meter. Or for all you Uber users, you may be used to an app telling you how much your ride will cost before you even get in the car. But that’s not the Cuban way. You have to haggle to get the best price for a taxi. Tip: Ask the locals how much a taxi should cost from where you are to where you want to go. One day we stepped out of the bus station to a group of taxi drivers who told us that they’d gladly drive us to the beach for 40 CUC (20 CUC per person). Of course that didn’t sound right so we went back into the bus station and asked a local who let us know that we shouldn’t pay more than 15 CUC total to get to the beach from where we were! We walked back into the parking lot and told the drivers that we weren’t paying more than 15 CUC. At first they told us no, but once they realized that we weren’t going to change our minds one of them agreed to our price and took us where we needed to go. Patience really is a virtue. Beautiful and not very touristy. This cute restaurant is located in Havana Vieja (Old Havana) and was such a good time. We bumped into the members all-female Afro-Cubana band in the bathroom and, as Black women do, we started talking about our hair. Their performance during dinner was beautiful and the food was so good that we decided to go back on our last night in Cuba. The band remembered us the next night and invited us up to dance with them for a part of their show. It was definitely one of our best nights in Cuba. If you love salsa this is definitely the place for you. Inside the hotel (you don’t have to pay to get in) there’s an open space where local salseros and salseras go to have a good time. I got to dance with some local salseros and got pulled into a Rueda that made my night. One of the things I most enjoyed out there was the fact that everyone wasn’t on their phones 24/7. People actually spent time with each other, instead of glued to their phone or computer screens. If you really need internet it’s available, but you have to work for it a little bit. There are paid wi-fi hot spots scattered around the major cities. To connect to the internet you have to visit ESTECA, the telecom company owned by the government, and buy a pre-paid internet card. You can buy either a 1-hour card or a 5-hour card. The 5-hour internet card cost about 7 CUC and lasted my friend and I the entire week that we were there, but we had to wait in line for 2 hours to buy one. If you ask me, all your incredible Instagram pics and Facebook updates can wait until you get back. Kick back, relax, and enjoy being disconnected for a few days. Wherever I go I like to ask the people who live there what cool things I should do or places I should visit. The best experiences I’ve had while traveling have been the non-touristy things that only a local would be able to tell you about. Almost all public bathrooms I went to in Cuba either had no soap, no toilet paper, or neither. Make sure that you always have some hand sanitizer and a packet of napkins in your bag for when you need to use the bathroom. You’ll be glad that you did. During the week we spent two days in a town called Vinales, about an hour and a half from Havana. For 20 CUC (about 20 US dollars) we rode a horse for 5 hours through the Cuban countryside near Vinales, visited a tobacco farm to watch them roll Cuban cigars, got an inside look at a coffee farm, and got to spend some time by a beautiful lake overlooking the mountains. Thanks to a minor in college and a few months studying abroad, my Spanish is pretty on point, but no matter how much Spanish you speak I think you’ll be fine in Cuba. Try to learn some basic phrases before you hop on the plane, but you can easily find ways to communicate once you’re there. Have a good travel buddy. I went with one of my closest friends and we had an incredible time. She was literally the perfect travel companion. Make sure that whoever you’re going with has street smarts, is good at budgeting money, and has all-around good vibes. The worst thing in the world is traveling with someone and getting tired of them after a few days. 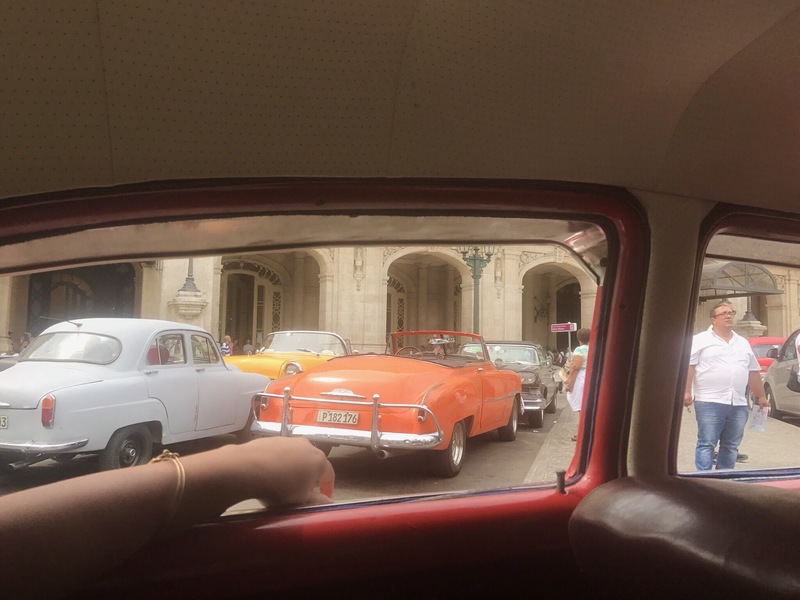 Obviously I couldn’t fit everything about my time in Cuba into this post. Jakiya Brown is the world traveler behind the blog The Traveling Fro. One of her recent blog posts on her trip to Cuba has more details that I didn’t talk about this one, like the average price for things and cool places to visit. Also check out this post on Aja Monae’s blog Live Life Wander, which has some tips for choosing your AirBnb and finding a place to stay. I’ve already gotten some emails and DMs about the trip, but if there’s anything you want to know that I didn’t talk about shoot me message! I’ll tell you anything I can.